On Tuesday, investigative journalist and documentary filmmaker John Pilger spoke with RT America’s Natasha Sweatte about the seemingly escalating nuclear situation on the Korean peninsula. RT: What are your thoughts on what the North Korean ambassador to Russia said today, that no sanctions will make North Korea change its policies, adding that North Korea’s nuclear program will help his country manage the “hostile policy” of the US? Don’t you think it’s just an excuse for Kim Jong-un to build up his arsenal? John Pilger: Look, the problem is not North Korea. The problem is not Russia. The problem is not China. The problem is the United States. There have been a number of agreements in the past, 1992, 1994, between North and South Korea to denuclearize Korea. The problem is the United States, and you have to look at this broadly. The problem for the rest of the world actually, now, is the containment of the United States. The US used to, during the first Cold War, talk about the containment of the Soviet Union, but no. It’s the containment of the United States and frankly, it always has been. Yes, it’s an unpredictable regime, but there’s absolutely no doubt that if North Korea hadn’t developed nuclear weapons, it would’ve been attacked. Or the same thing would have happened, something similar would have happened to North Korea as happened to Libya and Iraq and Syria and Afghanistan. RT: Will China help enforce the UN sanctions, and do you think the country feels alarmed over the recent actions coming out of Pyongyang? JP: No, China is mostly alarmed by the United States, not by North Korea. It’s always been rather a worry that North Korea might provoke the United States, but even these sanctions that have gone through the Security Council, the United Nations sanctions, China has all ways of getting ’round them. They use Chinese currency, Chinese firms, so they don’t really work anyway. China’s main concern is that Pyongyang will provoke the United States, and that’s always, historically, that’s always been China’s concern. RT: And speaking of sanctions to North Korea, why do you think the United Nations is targeting some of the country’s biggest remaining foreign revenue streams, but leaving its oil alone, which clearly, it would need for its huge military? JP: I don’t know, frankly, and I don’t think it actually matters. Because, these sanctions are just going to not work on North Korea. North Korea has, over the years, developed a way of life, a way of development, a way of developing its strategic weapons, knowing that it’s going to be almost in a permanent state of siege. So, I don’t think any of these sanctions matter at all. As I say, North Korea will be able to – they’ve stopped short at oil anyway – but North Korea will be supported by China. China just does it in a different way. They, instead of dealing with Koreans, deal with Chinese businessmen in Korea, so, like all sanctions, there are ways ‘round them. Sanctions are irrelevant in a sense to this whole debate. What is needed is a peace treaty with North Korea, between the United States and North Korea and the government in Seoul. But where it’s all heading is the most worrying thing of all. And we’ve just seen, although it’s not reported as far as I can tell in the United States, we’ve now seen a NATO document in Germany released by a research group there and in several of the German newspapers, that says that the whole question of whether NATO actually increases its nuclear weapons is the most important one. And what this document is saying is that there is the beginning of the end of the intermediate range nuclear weapons treaty. That’s the most important treaty of the old Cold War. Once you take that away, then you’ve got the real threat of nuclear war between the great powers. So, in a way, North Korea is a sideshow to this. That’s the main game. RT: And now it’s rumored that President Trump will visit China in November, and you know, he’s invited President Xi Jinping to Mar-a-Lago and has said some nice things about the president. Why do you think China hasn’t really stepped in by now to try and help ease tensions between the US and North Korea. Does China have too much of a stake in North Korea financially? JP: I think China has stepped in to ease tensions. 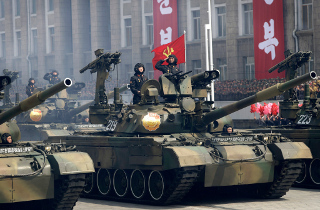 China and Russia have a strategic plan that they put to the United States that has been dismissed out of hand, that says if the United States and the government in South Korea stop these provocative military exercises, that he include as they put it, the decapitation of the Pyongyang regime, if they stop these provocative exercises, then the current testing in North Korea itself will cease. So, China and Russia have actually come forward with positive plans. As I said at the beginning, the real problem to all this is the containment of the world’s biggest nuclear power, the United States. John Pilger is a journalist, film-maker and author, John Pilger is one of two to win British journalism’s highest award twice. For his documentary films, he has won an Emmy and a British Academy Award, a BAFTA. Among numerous other awards, he has won a Royal Television Society Best Documentary Award. His epic 1979 Cambodia Year Zero is ranked by the British Film Institute as one of the ten most important documentaries of the 20th century.